Christianity came under sustained attack in the twentieth century, not only from obvious unbelievers, but from many who occupied seats in the temple and chairs in the academy. One argument frequently used in their effort to subvert Christianity is the alleged inadequacy of human language to express divine truth. Statements about God, we are told, are mythological, analogical, poetical, or allegorical; they are not—they cannot be—literally true. 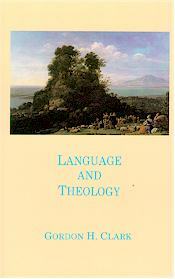 In Language and Theology, Dr. Clark presents a masterful and devastating analysis of those secular and religious thinkers who deny that human words can express divine truth. Included in Modern Philosophy. Part 1: Secular Theories: Scope and Importance; Skeletal History; Bertrand Russell; Ludwig Wittgenstein; Rudolf Carnap; A.J. Ayer, Herbert Feigl; The Later Wittgenstein. Part 2: Religious Theories: Wilbur Marshall Urban; E.L. Mascall; Horace Bushnell; Langdon Gilkey; Interlude; William Hordern; Kenneth Hamilton; A Christian Construction; Scripture Index; Index.